To prepare for KO dyeing, I have been doing a little experimenting with color gradients. More on that soon. Today's WTF moment is brought to you courtesy of the T Shirt Sweater. 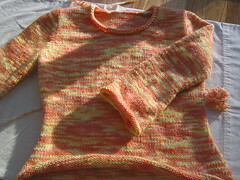 Creamsicle T is close to done. Ends woven in, just the neckline to finish. I followed the instructions, pick up stitches, cast off on the next row. No problem. Except, it looked like crap. Hmm. Where did I go wrong? Not that many ways you can pick up and cast off. Kinda hard to see the neckline. Next. It's tiny! Come on guys, show me some neck. You've got to be kidding me. 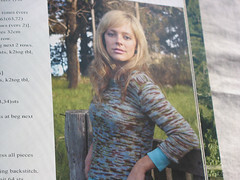 Out of 6 photos of this sweater, none of them shows clear neckline details! WTF??? 6 photos people. 6!!! but it's just not working for me. I think a simple neckline like the photos (what little you can see) works best; I guess I'll have to figure out how to make it so. She does have nice hair, but that is ridiculous! What book is that? I bet they obscured the neckline because it looked like crap for them too. I've read that it's a bad idea to knit anything where the model is twisted up into some weird pose, because that's probably the only pose they found that makes the garment look good. That may be the case here, with the hair. Patterns should be required to show at least one good photo of every important feature. Sometimes all you've got to go on is one shadowy picture from the wrong angle. WTF indeed. How frustrating! I am sure you will come up with something that looks great, but those pictures are terrible with all that hair. How funny! I know how those pictures can be - sometimes you really have no idea how the things are going to look in real life. Of course, we have a beautiful sample in the store, so I've got a pretty good idea of how it will look. And it's very helpful to see how you dealt with yours. It came out great!